This article is about the definition of the terms publish and publication in copyright law. For more general discussion, see publishing. To publish is to make content available to the general public. While specific use of the term may vary among countries, it is usually applied to text, images, or other audio-visual content, including paper (newspapers, magazines, catalogs, etc.). The word publication means the act of publishing, and also refers to any printed copies. the distribution of copies or phonorecords of a work to the public by sale or other transfer of ownership, or by rental, lease, or lending. The offering to distribute copies or phonorecords to a group of people for purposes of further distribution, public performance, or public display, constitutes publication. A public performance or display of a work does not of itself constitute publication. The US Copyright Office provides further guidance in Circular 40 , which states: "When the work is reproduced in multiple copies, such as in reproductions of a painting or castings of a statue, the work is published when the reproductions are publicly distributed or offered to a group for further distribution or public display". The definition of "publication" as "distribution of copies to the general public with the consent of the author" is also supported by the Berne Convention, which makes mention of "copies" in article 3(3), where "published works" are defined. In the Universal Copyright Convention, "publication" is defined in article VI as "the reproduction in tangible form and the general distribution to the public of copies of a work from which it can be read or otherwise visually perceived." Many countries around the world follow this definition, although some make some exceptions for particular kinds of works. In Germany, §6 of the Urheberrechtsgesetz additionally considers works of the visual arts (such as sculptures) "published" if they have been made permanently accessible by the general public (i.e., erecting a sculpture on public grounds is publication in Germany). Australia and the UK (as the U.S.) do not have this exception and generally require the distribution of copies necessary for publication. In the case of sculptures, the copies must be even three-dimensional. The publication must be generally available. The date of publication is the date the published material became generally available. Electronic publication with some restrictions is permitted for publication of scientific names of fungi since 1 January 2013. Book: Pages attached together between two covers, to allow a person to read from or write in. Bulletin: Information written in short on a flyer or inside another publication for public viewing. Bulletins are also brief messages or announcements broadcast to a wide audience by way of TV, radio, or internet. Booklet: Leaflet of more than one sheet of paper, usually attached in the style of a book. Broadside: A large single sheet of paper printed on one side, designed to be plastered onto walls. Produced from 16th - 19th cent. Became obsolete with the development of newspapers and cheap novels. Leaflet: Single sheet of paper printed on both sides and folded. Journal: A book with blank pages inside, to allow you to write down any personal information. Another word for a newspaper or similar publication. Newsletter: A bulletin, leaflet, pamphlet, or newspaper distributed to a specific audience. Newspaper: A publication of several pages printed with news, sports, information, and advertising. Newspapers may be published and distributed daily, weekly, monthly, quarterly, or annually. Magazine: A book with front and back paper covers, printed with information and advertising. Some magazines are published and distributed every week or every month. Pamphlet: Can be a leaflet, booklet or saddle-stapled booklet. Electronic publishing (also referred to as e-publishing or digital publishing or online publishing) includes the digital publication of e-books, digital magazines, and the development of digital libraries and catalogues. Electronic publishing has become common. It is also becoming common to distribute books, magazines, and newspapers to consumers through digital devices, by online sources. 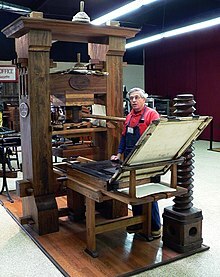 Modern computing and networking have revolutionized publishing. Server rack, delivering data to inquiries. Brochure: an informative document made for advertising products or services, usually in the form of a pamphlet or leaflet. Tract: a religious or political argument written by one person and designed to be distributed free, usually in the form of a booklet or pamphlet, but sometimes longer. Monograph: a long research publication written by one person. A work that has not undergone publication, and thus is not generally available to the public, or for citation in scholarly or legal contexts, is called an unpublished work. In some cases unpublished works are widely cited, or circulated via informal means. An author who has not yet published a work may also be referred to as being unpublished. ^ a b Berne Convention, article 3(3). URL last accessed 2010-05-10. ^ a b Universal Copyright Convention, Geneva text (1952), article VI Archived 2012-11-25 at the Wayback Machine. URL last accessed 2010-05-10. ^ German UrhG, §6, in German. URL last accessed 2007-05-29. ^ Australian Copyright Act, section 29: Publication. URL last accessed 2007-05-29. ^ Copyright, Designs and Patents Act 1988 (c. 48), section 175, Copyright law of the United Kingdom. URL last accessed 2007-05-29. ^ Hawksworth, D. L. (2011). "A new dawn for the naming of fungi: impacts of decisions made in Melbourne in July 2011 on the future publication and regulation of fungal names". MycoKeys. 1: 7–20. doi:10.3897/mycokeys.1.2062. PMC 3359813. ^ "APA REFERENCE STYLE: Unpublished Sources". linguistics.byu.edu. 2002. Retrieved 7 March 2012. Look up publication in Wiktionary, the free dictionary.